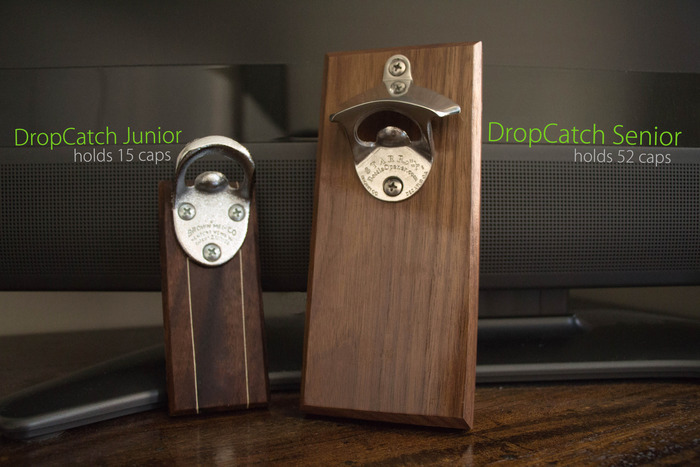 Wall-Mounted Magnetic Bottle Opener | OhGizmo! Apologies for the large GIF. But we think that the above animation pretty much does the entire job of describing the product, which we like because we can be lazy sometimes. In case it’s not working on your device, it’s a simple bottle opener with the added benefit of magnets to catch falling caps. That too is appealing for the lazy-minded, since you’ll have less tidying to do after your guests have left. The DropCatch, as it’s called, comes in two sizes. The large one can catch up to 52 caps, while its smaller brother tops out at 15. Prices are $60 and $40, respectively, and involve making a pledge on everyone’s favorite crowdsourcing site, Kickstarter.